Every pool owner should check the most important parameters in his pool at regular intervals. This is the only way to ensure that water quality is maintained at correct levels and arrange dosing in an optimum manner. 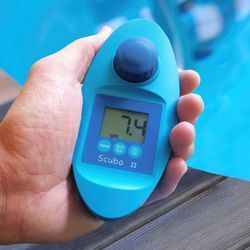 The Lovibond Scuba II enables the operator to check pool water quickly and accurately. The integrated sample chamber is filled by immersing it in the water. A tablet reagent is added and generates a characteristic colour which is measured using the photometric principle. The result is then displayed on the screen. 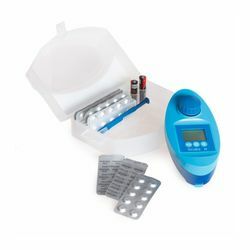 Five parameters, free chlorine, total chlorine, pH, alkalinity and stabiliser (cyanuric acid) are measured within a few minutes. 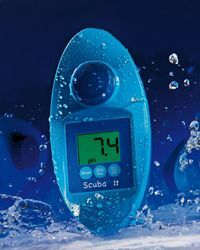 Water analysis becomes a pleasure rather than a chore and more time is left for enjoying the pleasure of the pool. 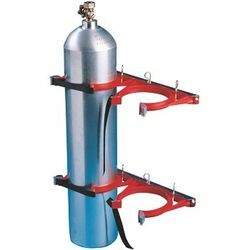 If the Lovibond Scuba II falls into water it will simply float and, of course, it is watertight. The Lovibond Scuba II utilises Photometer tablets to carry out measurements. These tablets are the same used in the PCCheckit, CheckitDirect, MD100, MD200 and other Lovibond® Photometers and are synonymous with the quality and accuracy expected from Lovibond® products. Contents: Scuba II in a robust plastic box, Tablet reagents - 20 of each DPD No.1 & Phenol Red, 10 of each DPD No.3, CyA-Test & Alka-M, 2 batteries (AAA), Stirring rod, Instruction manual.